Say, who is that guy, anyway? This time for a change, I decided to find out who he was, and he turned out to be character actor Herb Vigran. According to the International Movie Database, he appeared in 314 TV episodes and movies between 1934 and 1987. His last film, “Amazon Women on the Moon,” was released the year after his death. 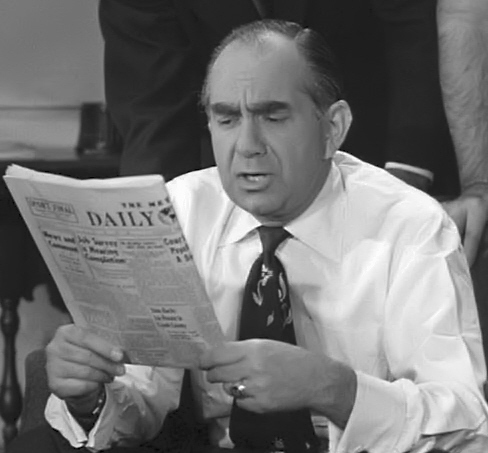 Vigran held a law degree, but he never practiced law because he was in love with acting. Besides all the TV and movies, he did some stage work, including the 1936 Broadway classic “Having a Wonderful Time” with John Garfield and Eve Arden. He also worked in radio and was a regular on “The Jack Benny Program” before doing three years of military service during World War II. 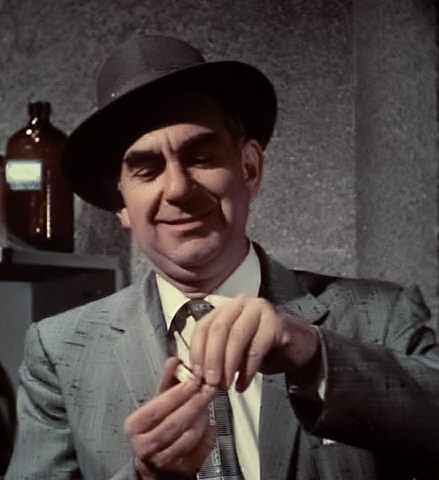 Herb Vigran in an episode of "The Adventures of Superman"
There are two things I still have to dig out in order to observe Christmas properly. 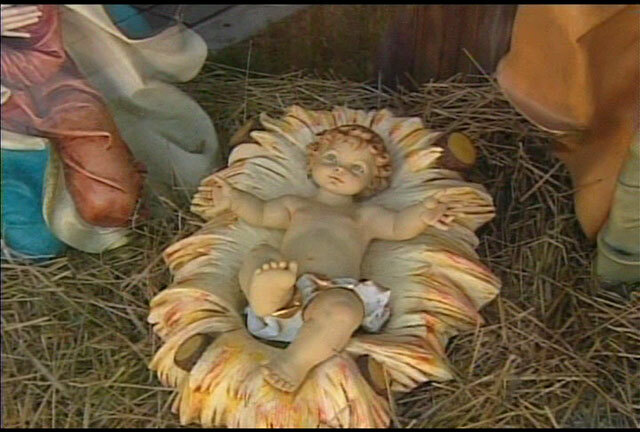 One is the heirloom manger figures; the other is the DVD of the “Dragnet” episode in which the statue of the infant Jesus is stolen from a creche in a Los Angeles mission church. 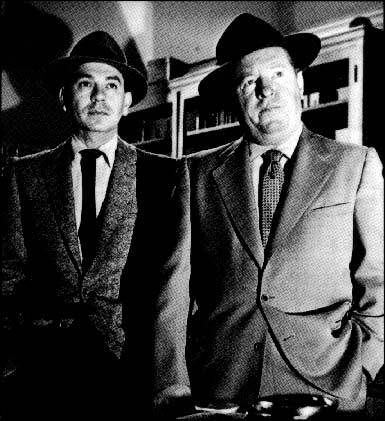 That’s the original 1953 version with Ben Alexander playing Frank Smith. Our manger scene consists of white plaster figures, made in France, that belonged to my mother. She told me that she received the set from a Syrian priest when she was a child, and it wasn’t new then. Most of the figures have been broken and repaired one or more times, and one of the animals mysteriously disappeared about ten years ago. The set has a classic look to it, so we wouldn’t consider replacing it. It’s a few cuts above those translucent, illuminated plastic ones that have appeared on various lawns in the past week or so. 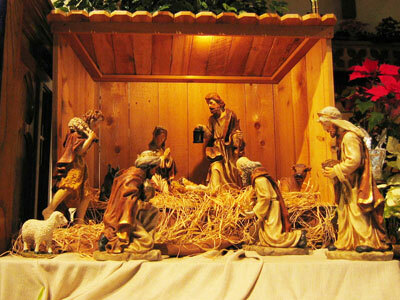 The tradition of assembling a manger scene — living or otherwise — originated in the 13th century with Francis of Assisi. 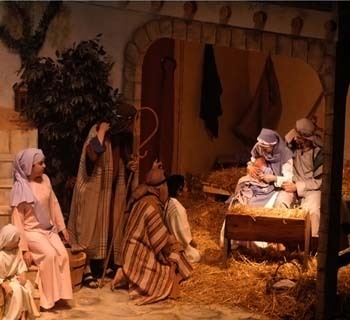 The “Dragnet” crowd apparently wasn’t familiar with the tradition in which the image of the child is not placed in the manger until Christmas Eve, in time for the midnight Mass. A church like the one depicted in that episode would almost certainly have adhered to that custom. I have noticed that the child hasn’t been placed even in many of the lawn scenes that are out there now. The child, of course, is the centerpiece of the feast, the vulnerable, innocent child who is both God and man in the belief of hundreds of millions of Christians. Why would God appear in human form — and as a newborn child? There is a learned and lovely reflection on this question on the blog “This Very Life,” written by Tania Mann in Rome. Those who are going to celebrate this holy day — and are very busy getting ready for whatever it implies for them — might want to spend a few minutes contemplating the reason for it all. If so, click HERE.